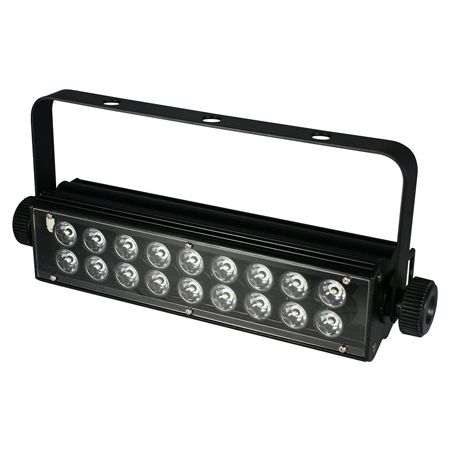 Fitted with 18 high-power 1W cool white LEDs, it's impressively bright. 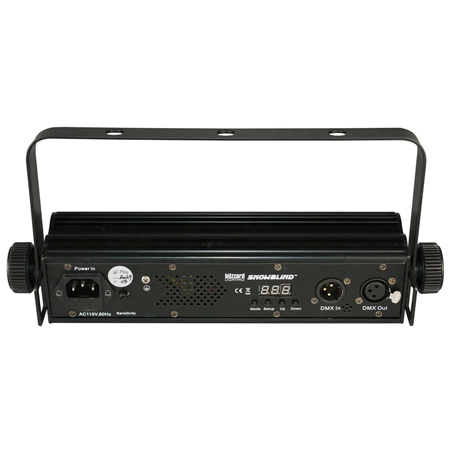 The SnowBlind features full range brightness/intensity adjustment, rate of strobe (speed), and internal microphone sensitivity that are fully controllable by just 3 channels of DMX, or by its easy to use 4-button LED control panel menu. Sound sensitivity can also be manually adjusted by the sensitivity adjustment knob that's located on the rear of the unit. You can also take full advantage of Blizzard's wiCICLE wireless DMX system without the need for external power thanks to the wiCICLE enabled DMX jacks! 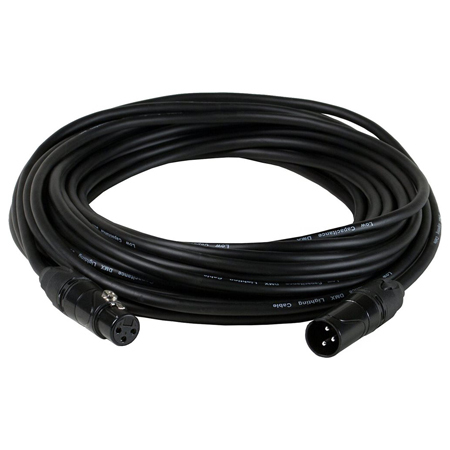 An innovative design provides power to the system directly from the fixture's DMX jack, meaning even fewer cords and less setup time. You can also use the SnowBlind in standalone mode, or link two or more together to run in Master/Slave mode to make a brilliant array of strobe fixtures, while each unit consuming only a tiny 25W of power! 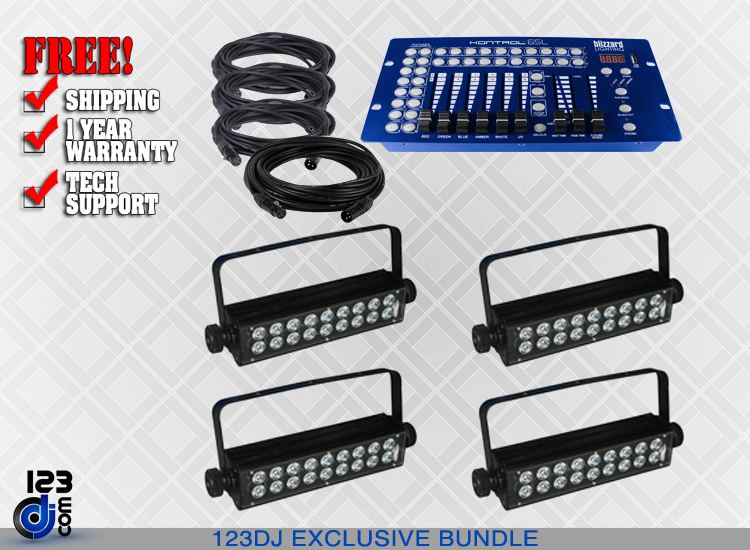 All theses goodies are packed into an attractive, light-weight, black aluminum housing with single mounting bracket and dual locking knobs for easy installation. The SnowBlind is simply an astonishingly bright, full featured white light LED strobe fixture that's ready-to-go straight out of the box! A compact DMX controller perfect for LED lighting fixtures with 6-in-1 LEDs per its conveniently labeled red, green, blue, white, amber, and UV sliders! 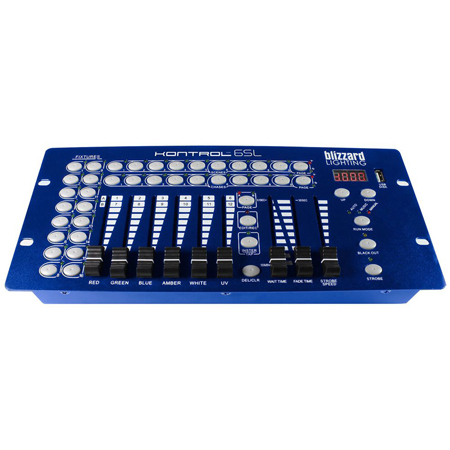 Kontrol 6SL allows for control of up to 18 fixtures composed of 10 channels each and up to 16 programmable scenes. With sixteen chase banks, Kontrol 6SL can contain up to 200 steps composed of saved scenes or manual inputs in any order. Trigger programs by music, automatically or manually. Plus, all chases can be executed at the same time. On the Kontrol 6SL's surface you will find various programming tools, including 6 universal channel sliders, quick access fixture + scene buttons, and an LED display indicator that makes for easier navigation of controls and menu functions.